Prefab Outdoor Kitchens – From DIY To Finished, We Have The Outdoor Kitchen Package For You. Use Our System And Save Thousands Now! Prefab outdoor kitchens are the best way to get the perfect outdoor kitchen for your needs. Outdoor kitchens are a great way to share valuable time with friends and family. And being able to cook and entertain at the same time is a priceless. Now that prefab outdoor kitchens have become more popular, the advantages of these spectacular outdoor kitchens are very evident. Prefab outdoor kitchens and grill islands offer all the appliances used in the typical indoor kitchen and more. Instead of having to leave the grill to go in the house for spices or sauce, you can simply walk a few steps to the built-in refrigerator or drawers. Combine that with large solid surface counter top areas and well thought out prep zones with sinks, trash chutes, and paper towel holders, you won’t ever need to go inside while cooking. And there are plenty of other appliances available. To make prefab outdoor kitchens even more versatile, you can choose nearly infinite styles and shapes to fit your available space and your taste. There are many configurations and all can be customized if needed. In addition, you can choose from a variety of stone colors to match your home or outdoor living space. We want your outdoor kitchen to represent YOUR style-not your neighbors! An outdoor kitchen is an investment. Llike any investment, you want it to last for years to come. Our modules are crafted with galvanized 20 guage industrial steel and factory welded for strength. Each componenet includes attached composite deck boards to prevent the module from coming into contact with ground dampness. 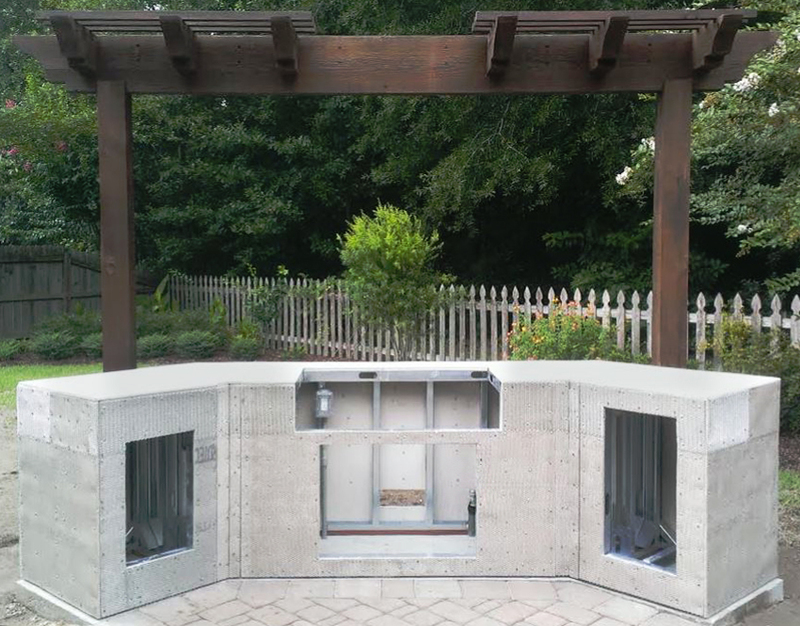 Big Ridge goes the extra mile to extend the life of your outdoor kitchen and protect the value of your investment. Your local contractor and the DIY Frame Kit guys hope you won't find this out. What is it? Watch this short video to see. Select-n-Connect modules come complete with everything you need, including the appliances. Just select your modules and connect them the way that fits your unique style! 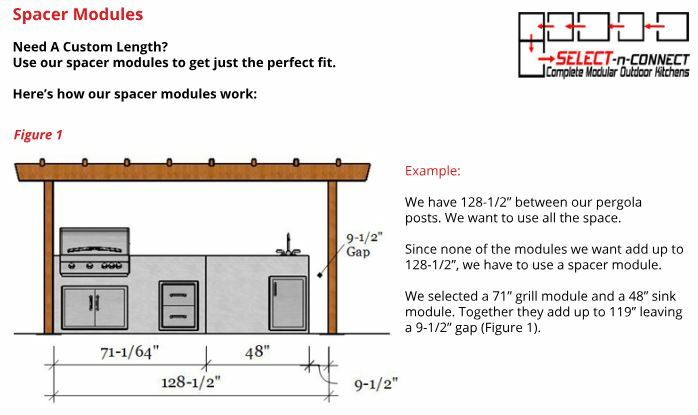 This is the fastest way to install a ready to finish outdoor kitchen. Each module takes about 5 minutes to put together with a few screws. Then you just slide together and bolt in place. A standard 10 foot outdoor kitchen takes about 15 minutes to be ready to finish. Choose from several standard module sizes. If you need a little more space, just order one of our spacer modules and get just the right fit. With a spacer module, you choose the width, we make it special for you. Prefer a more custom feel or have other appliances in mind? 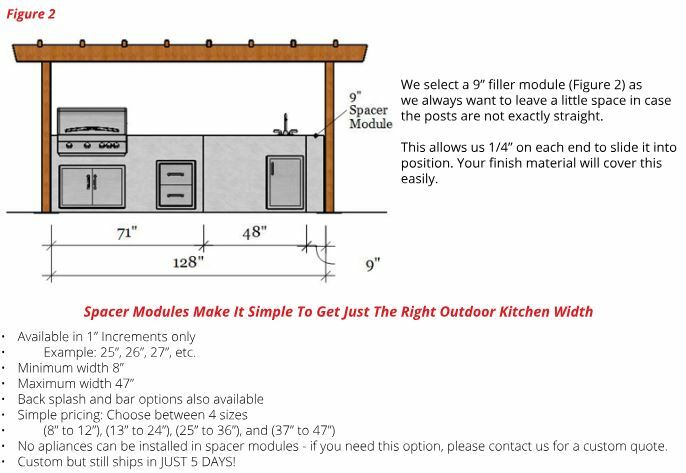 Our Rapid Panel Custom Outdoor Kitchen Modules are the way to go. We build to your specs. We have the highest quality appliances in price ranges to fit any budget. Already have your appliances? No problem, we will build with your specifications. With Rapid Panels, you get all the benefits of our Select-n-Connect modules with the flexibility of completely custom designs. We offer free design assistance and work with you every step of the way. No cutting, no mess, just professional results the first time. Be ready to finish your outdoor kitchen in under 15 minutes. Let us help you DIY this! Free Design Service - Using our modules, you can easily design your own kitchen, or one of our expert designers will work with you through the process of planning and designing your outdoor kitchen. If you already have a design, simply upload it to us by going to the CONTACT US page. Easier yet, email your design to sales@bigridgeoutdoorkitchens.com. Easily Assembles In Minutes - Our designers will send you a free 3D Drawing and revise it until you are thrilled with the design. Stand the panels up and install a few screws. Connect the modules together and level. Yes, that’s it! We have even made the holes for your appliances, installed your vents and GFIs (if ordered). Now simply slide in your grills and accessories. Add Your Finish And Enjoy - Finish with your choice of stone, stucco, etc. 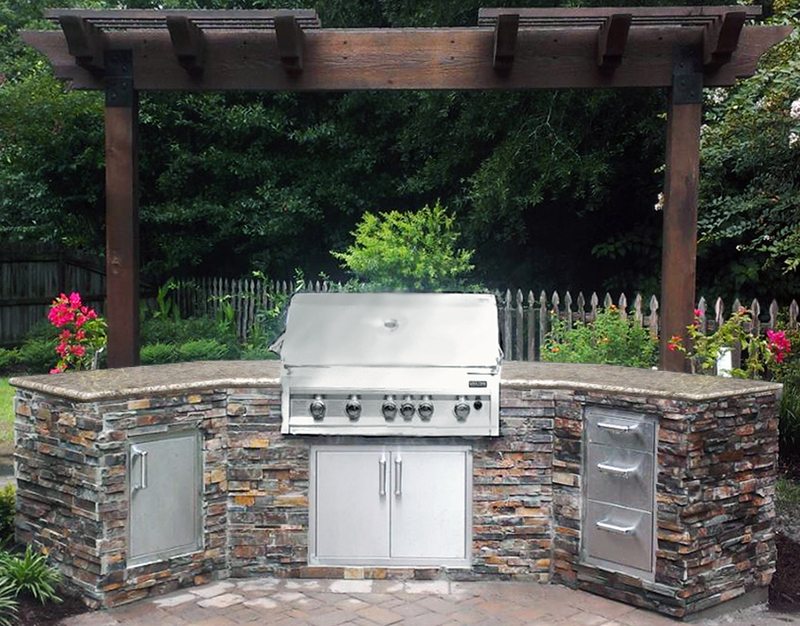 Even if you have someone else finish it, you will still save up to 40% over a custom site-built outdoor kitchen. Sit back and invite your neighbors over to enjoy a great meal (and to show them your new outdoor kitchen). Let’s DIY this! 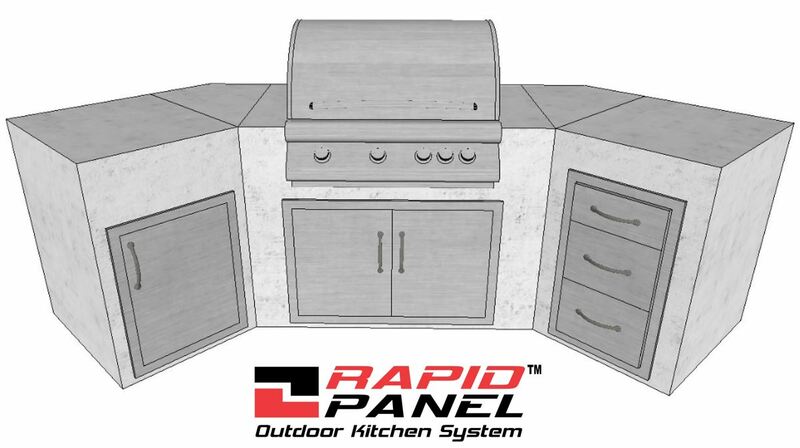 With Rapid Panel Outdoor Kitchen Kits, you can easily and affordably add a custom outdoor living area to your home. Get started on your project now. Big Ridge Outdoor Kitchens offers many options from clean and modern outdoor kitchens to a prestigious Outdoor Oasis. We are the industry leader in prefab outdoor kitchens. If you’re ready to see how affordable unsurpassed luxury can be, Click Here, You will be glad you did. 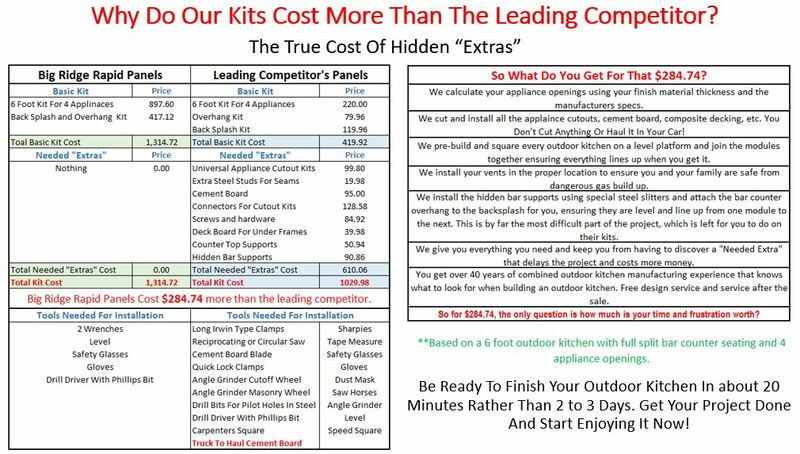 We also offer design assistance and package deals when you purchase your outdoor kitchen kits and appliances from us. Call us at 210-483-3114 or email us at sales@bigridgeoutdoorkitchens.com to let us design the perfect outdoor kitchen for you, it doesn’t have to cost a lot! Use our handy free design planner to get you started. We look forward to helping you. Are you looking for a complete, modern, and contemporary outdoor kitchen design? Take a look at our line of premium Challenger modular outdoor kitchens. These premium outdoor kitchens are sleek and simplistic in design, but are full featured. Constructed of aluminum, these cabinets are light weight yet solid. They will not rust or rot, they are made to last a lifetime, which is how long they are guaranteed for. But, that’s only half the story. Challenger cabinets come fully assembled so set up time is a matter of minutes. If you want to move them around later-no problem. They are light weight and since they are not built in, you can take them with you, even if you sell your home. Want a sink but don’t want to run water out to your outdoor kitchen? Challenger offers a fully self contained water system that runs off electric or battery power. The unit comes complete with a sink, pump, 5 gallon clean water, and 5 gallon gray water containers. Great for winterizing because you just take out the water containers. The Challenger prefab outdoor kitchens are available in many standard and premium colors to match your style. The cabinets are modular meaning you can create the shape and style that fits your area and your budget. And if you want, you can always add on later, the cabinets are made so you can simply order another module and attach it whenever you want to.